"Cream, Fresh Cream OBI Box Set"
CREAM - FRESH CREAM OBI BOX AND THESE TITLES - WHEELS OF FIRE - DISRAELI GEARS - FRESH CREAM - LIVE CREAM - LIVE CREAM VOLUME II - AND GOODBYE - Japanese OBI MINI REPLICA BOX SET Japanese re-mastered Mini LP replica Limited Edition Collection Recorded from the finest Original Masters available. Each title Comes with anti-static sleeves similar to Vinyl LPs, Cardboard packaging exact to the original LP, Re-sealable plastic wrap cases for protection of each collectible Actual miniaturized version of the 12" LP in 4" CD version Special VERY RARE LIMITED EDITION BOX SET ONLY PRODUCED ON FUTURES FOR THIS ONE TIME PRESSING -- were only available in Japan. Check out Mymusicfix for additional Audiophile by hitting http://stores.ebay.com/Mymusicfix to view our current items up on E-Bay. E-BAY STORE. FOR YOUR ADDITIONAL OBI RARE BOX SET SELECTIONS - INDIVIDUAL TITLE INFORMATION OR INDIVIDUAL PURCHASE JUST HIT THIS STORES TAB >. & TYPE IN OBIBOX INTO THE SEARCH FIELD WITHIN OUR STORES SECTION AS YOUR PERSONAL CODE AND ALL INDIVIDUAL TITLES + INFORMATION WILL APPEAR CREAM - FRESH CREAM OBI BOX AND THESE TITLES - WHEELS OF FIRE - Track Listings Disc: 1 1. White Room - Cream, Bruce, Jack 2. Sitting on Top of the World - Cream, Chatmon, Lonnie 3. Passing the Time - Cream, Baker, Ginger 4. As You Said - Cream, Brown, Peter  5. Pressed Rat and Warthog - Cream, Baker, Ginger 6. Politician - Cream, Brown, Peter  7. Those Were the Days - Cream, Baker, Ginger 8. Born Under a Bad Sign - Cream, Bell, William 9. Deserted Cities of the Heart - Cream, Brown, Peter  Disc: 2 1. Crossroads - Cream, Johnson, Robert [01 2. Spoonful - Cream, Dixon, Willie 3. Traintime - Cream, Bruce, Jack 4. Toad - Cream, Baker, Ginger DISRAELI GEARS - Track Listings 1. Strange Brew - Cream, Clapton, Eric 2. Sunshine of Your Love - Cream, Clapton, Eric 3. World of Pain - Cream, Pappalardi, Felix 4. Dance the Night Away - Cream, Bruce, Jack 5. Blue Condition - Cream, Baker, Ginger 6. Tales of Brave Ulysses - Cream, Clapton, Eric 7. Swlabr - Cream, Bruce, Jack 8. We're Going Wrong - Cream, Bruce, Jack 9. Outside Woman Blues - Cream, Reynolds, Blind Joe 10. Take It Back - Cream, Bruce, Jack 11. Mother's Lament - Cream, Traditional FRESH CREAM - Track Listings 1. N.S.U. - Cream, Bruce, Jack 2. Sleepy Time Time - Cream, Bruce, Jack 3. Dreaming - Cream, Bruce, Jack 4. Sweet Wine - Cream, Baker, Ginger 5. Spoonful - Cream, Dixon, Willie 6. Cat's Squirrel - Cream, Traditional 7. Four Until Late - Cream, Johnson, Robert [01 8. Rollin' and Tumblin' - Cream, Waters, Muddy 9. I'm So Glad - Cream, James, Skip 10. Toad - Cream, Baker, Ginger 11. I Feel Free - Cream, Brown, Peter [ LIVE CREAM - Track Listings 1. N.S.U. - Cream, Bruce, Jack 2. Sleepy Time Time - Cream, Bruce, Jack 3. Sweet Wine - Cream, Baker, Ginger 4. Rollin' and Tumblin' - Cream, Waters, Muddy 5. Lawdy Mama - Cream, Clapton, Eric LIVE CREAM VOLUME II - Track Listings 1. Deserted Cities of the Heart - Cream, Bruce, Jack 2. White Room - Cream, Bruce, Jack 3. Politician - Cream, Bruce, Jack 4. Tales of Brave Ulysses - Cream, Clapton, Eric 5. Sunshine of Your Love - Cream, Clapton, Eric 6. Steppin' Out - Cream, Bracken, James AND GOODBYE - Track Listings 1. I'm So Glad - Cream, James, Skip 2. Politician - Cream, Bruce, Jack 3. Sitting on Top of the World - Cream, Chatmon, Lonnie 4. Badge - Cream, Harrison, George [1 5. Doing That Scrapyard Thing - Cream, Bruce, Jack 6. 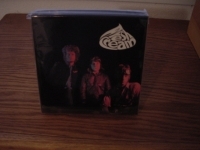 What a Bringdown - Cream, Baker, Ginger These are Japanese digitally re-mastered Mini LP replica CDs (the OBI Edition). This Limited Edition Collection has only VERY FEW made world-wide and are immediately Out of Print. Recorded from the finest Original Masters available. Comes with anti-static sleeves similar to Vinyl LPs, Cardboard packaging like an LP. Actual miniaturized version of the 12inch LP in 4inch CD version.